Virtually EVERYONE has an opinion about leadership. Leadership seminars run for days discussing various leadership styles. At some point however, leadership programming has to define the qualities of 'high performing' leaders with measures. PeopleAssets conducts empirical research with specific client populations to define 'high performance' leadership year after year. This graph demonstrates how empirical benchmarks reveal critical trends in the workforce. Two groups were identified from a client sample, leaders and staff. Both were compared to an overall PeopleAssets benchmark (middle bar). 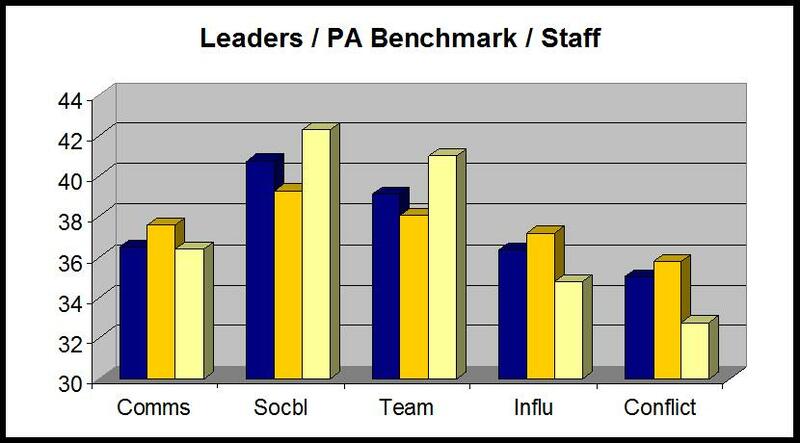 Each client sample scored slightly below the overall PA benchmark on communications. Both samples also showed strengths with regard to sociability and team play. On both influence and conflict management dimen-sions, the sample leaders had moderate capabilities, but the staff showed clear needs in those areas. Since influence and conflict resolution skills were critical to success in this role, organizational trainers knew precisely where to direct their attention.